Description: Running a gallery is one thing, wearing a gallery is another. Enjoy a beverage in Atlantic Canada’s right across from the site of the WTCC, and engage in a panel discussion by three truly mobile galleries; Hannah Jickling’s Coat Of Charms, the Alopecia Gallery (a gallery on Gordon B. Isnor’s face), and Valerie LeBlanc and Daniel Dugas’ Media Pack Board. Following this will be a live performance of Media Pack Board in various locations along Halifax’s busiest nightlife destination Argyle Street. Friday evening will be a chance to wind down at the homegrown gallery of 161 Gallon Gallery. This gallery has existed in the home of Daniel Joyce and Miriam Moren on the corner of Robie and Cunard in Halifax for almost a decade exhibiting works by many of Halifax’s emerging and established contemporary artists. Miriam and Daniel invite the WPGC to their home for a talk and reception of the work of Lukas Pearse in 161 Gallon Gallery. Description: Eyelevel’s very own softball team The Eyelevelers take on the Khyber Klubbers in a seven inning softball showdown and picnic. SUNSCAD will accompany us with some fun activities, while portable gallery’s roam the Halifax Commons. Sip some homemade lemonade, get yer hot dogs and cracker jacks, while taking in the Coat Of Charms, the Nanomuseum, or the Alopecia Gallery, all while working on evening out that farmers tan! Daniel Joyce, (b. 1982, Newmarket, ON) currently lives in Halifax, NS as an artist and Artistic Director for the Khyber Centre for the Arts. Joyce studied Fine Arts at Fanshawe College in London, Ontario before moving out east to finish his BFA at NSCAD in 2007. Besides making art Joyce enjoys writing, having been published by Hunter and Cook Magazine and Atlantic Canada’s Visual Arts News Magazine. Miriam Moren was born in Vancouver, British Columbia and studied fine arts and art history at Langara College (Vancouver) , NSCAD University (Halifax) and recently Contemporary Studies at the University of Kings College in Halifax, Nova Scotia where she currently resides and works. Craig Leonard is a lampshade floating on molten mayonnaise on the soft shoulder of the Black Forest. He reports for the Times, the Sun, the Daily, and the Exquirer. The Velcro Gallery is a circular patch found on fitted fabric worn and curated for the WPGC 2012 by the Honourable Beck Gilmer-Osborne. Beck Gilmer-Osborne is a third year NSCAD student majoring in Intermedia and Art History. Relocated from rural Ontario, where the population’s favored artwork includes Robert Bateman and Norman Rockwell, Rebecca could not be more honored to be a part of the WPGC. Felipe Escudero‘s futuristic work explores generative design techniques and numerically controlled manufacturing methodologies towards the production of integrated architecture. He is currently part of the group RES at the Design Research Lab of the Architectural Association, undertaking a Masters in Architecture and Urbanism. Felipe has previously worked for kokkugia in London and for MAD Architects in Beijing. Originally from Halifax, Nova Scotia, pluri-disciplinary artist and writer Valerie LeBlanc has worked in Canada, the United States, France, England and Australia. Her creations travel between poetry, performance, visual and written theory. 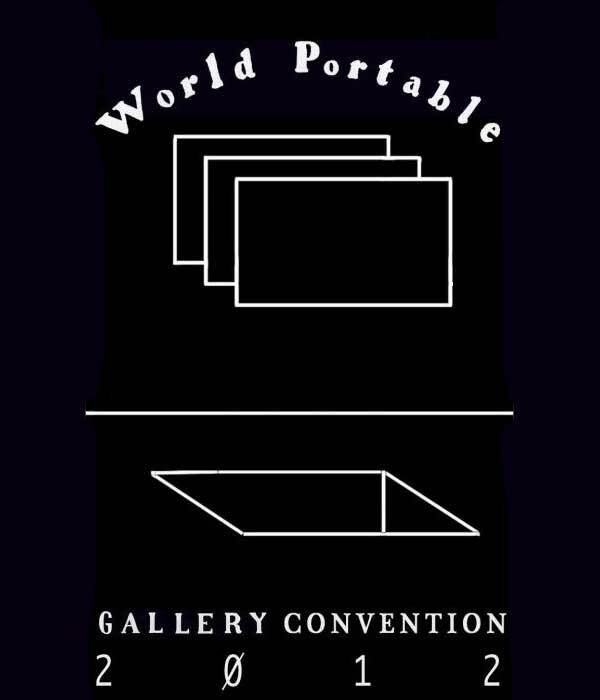 Valerie LeBlanc has been creating video poetry since the mid 1980’s, and is the creator of the MediaPackBoard (MPB), portable screening / performance device. She is currently based in Moncton, NB Canada. Daniel Dugas is a videographer, poet and musician. He has participated in solo and group exhibitions as well as festivals and literary events in North America, Europe, Mexico and Australia. His seventh book of poetry: Au large des objets perdus was published by Les Éditions Prise de parole, 2011. His novella, The Moss Theory, was published by Basic Bruegel Editions this summer. Paul Hammond is a Halifax-based screen-printer and illustrator. Primarily his work takes the form of a collaborative partnership with artist Seth Smith, under the name Yorodeo. They focus on collaborative drawing, collage, and creating limited edition, hand-pulled screen-prints and gigposters, as well as exploring anaglyphic 3D screen-printing by hand. Much of Hammond’s solo work considers questions surrounding the nature, authenticity, and relevance of objects, spaces and structures – often presenting objects, re-framed and given new context or meaning. For instance, a Halifax residential attic crawl space re-purposed, and run for two years as a functional art gallery, with co-curator Francesca Tallone. Francesca Tallone is an American-born, Montreal-based photographer and curator. She has exhibited both her own work and curated shows throughout the US, Canada and Europe. She is co-curator of a gallery in Munich, Germany that is smaller than a business card. Her current roster of photographic pursuits include working with Montreal clothing designers and shooting images a book of new work, hopefully due out in 2013. She can be found wandering around at patternclash.tumblr.com. Gordon B. Isnor (BFA, NSCAD) founded the Alopecia Gallery in 1996. The gallery has featured shows by Michael Fernandes, Sandy Plotnikoff, Darrin Heaton, Amy Baker, Paige Gratland, and Julia Baird and participated in the group show There’s A New Beard In Town (http://www.orgallery.org/webprojects/hannah/about.html), organized by Hannah Jickling in association with Or Gallery Vancouver. Kate Rich is an Australian-born artist & trader. At the turn of the century she launched Feral Trade, a public experiment trading goods over social networks. She is currently developing protocols to define and manage amenities of hospitality, catering, sports and survival in the cultural realm. Meredith Kooi is a doctoral student in the Graduate Institute of Liberal Arts and certificate student in Comparative Literature at Emory University where she organizes the salon series SENSORIUM for the Visual Scholarship Initiative. She received her MA in Visual and Critical Studies from the School of the Art Institute of Chicago and her BA in Environmental Studies from Denison University. She is the Editor for Radius, an experimental radio broadcast platform based in Chicago, IL. She has been published in the DVD journal ASPECT: The Chronicle of New Media Art and has a forthcoming essay in The Contemporary Visual Studies Reader edited by James Elkins (Routledge). Her visual and performance work has been shown in galleries and medical venues both nationally and internationally. Her dissertation work centers on the aesthetics of the autoimmune condition as a physiological phenomenon and structuring logic of selfhood, the social, and politics. Hannah Jickling is from the Canadian north and currently lives and works in Toronto. Her project interests look at sport, outdoor recreation and education as models for performance, participation and feminist engagement. Together with Helen Reed, she is artist-in residence and visiting scholar at the Ontario Institue for Studies in Education, supported by The Pedagogical Impulse, a SSHRC-funded research project. Hannah is curator and performer of The Coat of Charms, a portable gallery inside a trench coat. Michael McCormack is an interdisciplinary artist from Halifax, Nova Scotia. He was the founder and custodian of the McCleave Gallery of Fine Art from 2002 until the suitcase gallery merged with the Suitcase Art Gallery Space Research Institute (SAGSRI) in 2007. Michael currently works as the Director of Eyelevel Gallery and representative for the Association of Artist-run Centres from the Atlantic. He has co-curated exhibitions throughout Canada, the Netherlands, Australia, and Ireland, and exhibited in solo and group exhibitions in galleries, festivals and artist-run centres across Canada, most recently at Eastern Edge Gallery in St. Johns, Newfoundland, and received individual artist funding from Nova Scotia Communities, Culture and Heritage. Michael recently completed the Electronics Residency at the Centre For Art Tapes in Halifax, NS, and will be exhibiting with the Confederation Centre for the Arts at Art in the Open in Charlottetown, PE in August of 2012, as well as with the Centre For Art Tapes as part of Nocturne: Art at Night in October 2012. Michael Eddy is a Canadian artist living since 2008 in Beijing, China, where for the last 2 years he has had the pleasure to be part of HomeShop, an artist-run initiative incorporating various social practices within the locality. He has frequently worked in collaboration with others, the most long term of which is the collaborative trio Knowles Eddy Knowles. His individual and collaborative work has been exhibited and published internationally. With a base in photography, he works across various media including performance, writing and installation, and is interested in decision-making processes, rhetoric, experience and narrative. Elizabeth Johnson is currently living in Halifax, NS where she originally moved to attend NSCAD University. She has found herself fortunate enough to be working with non-for-profit artist run collaborations such as Eye Level Gallery and Art Bikers. She is experimenting in as many mediums as possible including weaving, architectural thread studies, and video malfunctions. Radius is an experimental radio broadcast platform based in Chicago, IL, USA. Radius features a new project semi-monthly with statements by artists who use radio as a primary element in their work. Radius provides artists with live and experimental formats in radio programming. The goal is to support work that engages the tonal and public spaces of the electromagnetic spectrum. All audio works are broadcasted locally on 88.9-FM with a secondary stream online. Jeff Kolar is an audio artist working in Chicago, USA. His work, described as “speaker-shredding” (Half Letter Press) and “wonderfully strange” (John Corbett), includes cross-platform collaboration, low-powered radio, and live performance. Jeff is also the director of Radius, an experimental radio broadcast platform.